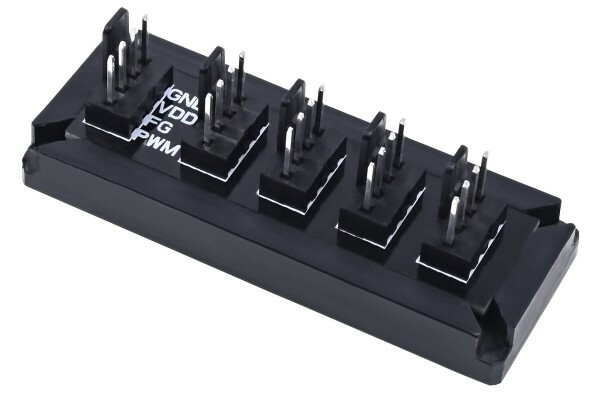 With this PWM splitter from Phobya it is possible to supply up to 4 PWM fans at the same time with electricity and also transfer the PWM signal of the first fan to all other fans (max. 4). This is especially useful for large radiators. The splitter is very compact and easy to install into your current system/case. You can place the splitter anywhere within your case/system through the adhesive tape which is at the back of the splitter. Optionally, you could use two screws to fix it at two outward-standing holes. 2 Frågor på andra språk. Ja, das kommt bald online. Ist das Kabel schon online? Mit welchem Kabel kann der Splitter an das Mainboard angeschlossen? Reicht ein Kabel aus, ist die Last von 4 Lüfter für ein Mainboard ok? Sie können hier ein normales 4-Pin PWM Kabel verwenden. Ein Mainboardanschluss hat überlicherweise 1A also 12W. Die meisten Küfter benötigen zwischen 1 und 2,5W. Das stellt für das Mainboard also kein Problem dar.